If you visit the southern Caribbean of Costa Rica, do not forget to visit Cahuita, a town that belongs to the province of Limón. Cahuita has a very Caribbean atmosphere, the area has an Afro-Caribbean culture so it has great links with Calypso music and authentic Caribbean cuisine. Here you can find a wide variety of public services like a bank, supermarkets, numerous restaurants for all the delights and a great variety of hotels that fit all budgets and tastes; here you will find the main entrance to Cahuita National Park, which is one of the most beautiful treasures in this Caribbean coast, with beautiful beaches and lots of wildlife. In addition, its tropical climate is constant during almost all the year, for this reason it's a great place to travel at any time of the year. Cahuita has beautiful black sand beaches, these are the quietest and most exotic of Limón, its warm and calm waters make this the perfect place for travelers looking for a quiet place and an attractive region to enjoy your vacation. Cahuita has many attractions that you can visit during your stay, or visit places very close to this area like Puerto Viejo or Limón city, where you can easily move. The Cahuita National Park extends around 55,000 hectares of protected marine environments and 600 hectares of terrestrial ecosystems and coral reefs. During the visit to this park you can do many activities such as hiking on the trails, practice scuba diving, snorkeling, swimming and canoeing. The snorkeling and diving are very popular activities in the park, because this zone has a beautiful coral reef. Also, the Cahuita National Park is a very important point for the leatherback turtle's nesting, this nesting occurs between March and July; other species of turtles also use this area to lay their eggs. In addition, this national park has a path from Kelly Creek Ranger Station to Puerto Vargas, these are about 4.4 miles of coastal footpath where you will enjoy countless wildlife. Near Cahuita you can take the Chocolate Tour and visit the Museum and the Chocolate factory, here you will also find the Bribri Indigenous Reserve, where visitors will learn about the history of cacao in Costa Rica, as well as learn how to make chocolate in a traditional way. This beach is located inside the Cahuita National Park, this is an exotic white sand beach, palm trees and forest; In this beach a voluntary contribution is requested in the entrance that helps with the expenses of the Cahuita National park. The schedule to this beach is from 8am to 4pm as it belongs to the national park, here you can carry out many activities, too. This beach is located 1 kilometer northwest of Cahuita down town, as its name indicates this beach has its black sand, here you can practice many activities, this beach is located very close to the road, for this reason has easy access to hotels or some places to eat. This is one of the entrances to the Cahuita National Park, access by this entrance is from 7am to 5pm. This beach has some great areas for barbecue, in addition you can enter by car to this zone. This is a very quiet beach, as it has very little visitation, grande beach is a perfect area to rest. 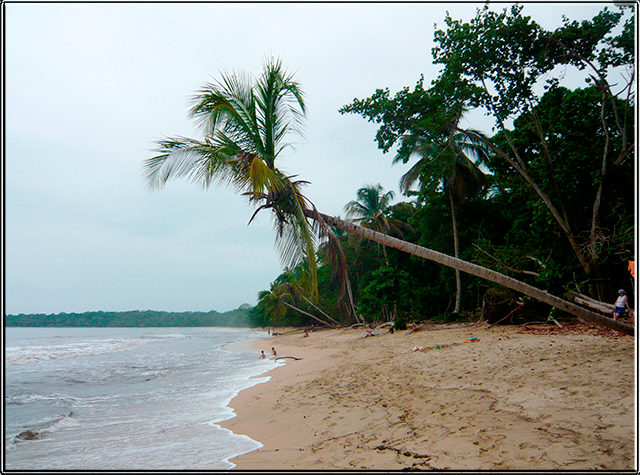 In Cahuita you enjoy many tours, or you can visit many beaches and areas very close to this exotic area. The shared transport will arrive at the lobby or the hotel reception for you; If your hotel is out of our route, we will tell you which is the closest hotel in which we can offer the service. Interbus offers daily shuttle service from the San José; offering two departure times, one in the morning around 07:30 am and in the afternoon around 14:45 hrs, the exact time of departure will depend on the hotel where you are staying. You can buy your tickets on the following link, we recommend you book in advance. You should head to the Caribbean Bus Terminal, where you must to choose to travel from San Jose to Puerto Viejo de Limón / Cahuita and can chooses the convenient schedule. If you choose to take a regional flight, this service can be offered by the company called Nature Air. If you want to book this service, please go to the follow link Nature Air.